iTunes includes a great way to have some captivating visuals when you're just hanging out with friends listening to your favorite music. Since its very first version, iTunes has had a visualizer, a built-in light show that you can use to play trippy animations while you listen to music. (Grateful Dead music not required.) You may not have ever used it, or even know it’s there, but it’s a lot of fun to turn on while listening to music, if you’re not working on your Mac (or if you just want to take a break). Altered states might make it even more interesting, but it’s a great way to have some captivating visuals when you’re just hanging out with friends listening to your favorite tunes. Here’s how it works. A quick press of two keys triggers the visualizer: while listening to music, just press Command-T, and sit back and watch the show. Start your iTunes light show by pressing Command-T.
As you can see in the screenshot above, the visualizer displays the name of the track and album, its artist, and its artwork, at the bottom left corner of the window for a few seconds. That way, you can always glance at your display when a new track starts playing to see what it is. If you want the visualizer to fill your display, choose View > Enter Full Screen, or press Control-Command-F. When you’ve had enough of your show, press Command-T to stop it. If that’s all the visualizer did, it would be pretty cool, but it gets a lot better. If you choose View > Visualizer, you’ll see that you can choose from several different plug-ins. There’s also a Play Videos setting. Select this if you’re playing music from a playlist that contains music videos, and you want iTunes to play the videos when it gets to them, rather than use the visualizer. Try with different songs and see how the visualizer changes. By default, it uses a random setting that cycles through a number of presets. But you can change the visualizer’s settings too. Press ? to see your options. 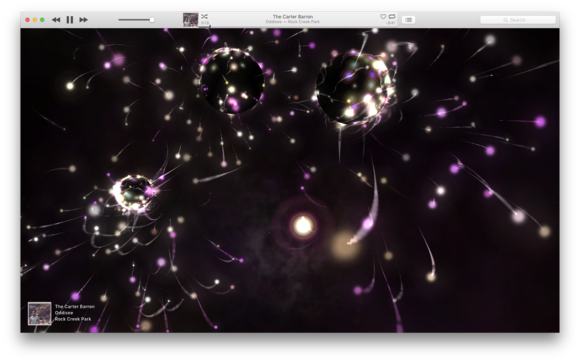 Here are the options for the iTunes visualizer. The visualizer displays keyboard shortcuts for its settings when you press the ? key. M changes the mode, which is the overall set of shapes that the visualizer uses. 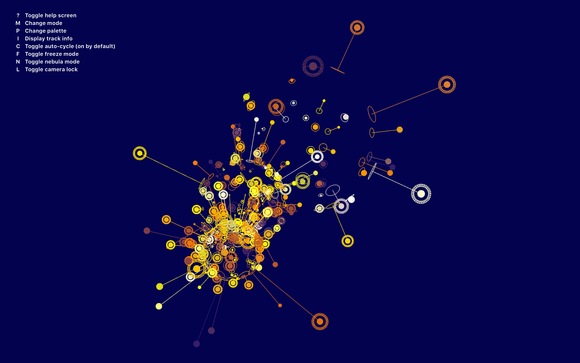 P changes the palette, or the color scheme of the visualizer. I displays track info at the bottom left of the screen; this is what you see in the first screenshot above, showing the track name, album, artist, and artwork. It fades away after a while. C toggles auto-cycle. This is on by default, and this tells the visualizer to change mode and palette at random. If you find a mode and palette you like, press C to keep that combination. F toggles freeze mode. If you see a visual you like, press F to freeze it so you can take a screenshot. This doesn’t freeze the display entirely, but it greatly reduces the movement, telling the visualizer to rotate but not dance around the display. This is a lot better for ambient music, which, as I mentioned above, dances too much with the default settings. N toggles nebula mode (though some modes don’t display nebulae). This adds iridescent clouds to the display. If you press E while in this mode, the clouds are enhanced. L toggles camera mode. This locks the visuals to more or less the same position on the screen. Pressing F and L (not at the same time) gives you an idea of how these two settings are related. When both are engaged, there is very little movement. A and S add or subtract rays in the current mode. + and - increase or decrease the brightness of the rays. R resets rays and their brightness to their defaults. Note that you can pause and resume playback while the visualizer is active by pressing the spacebar, and you can skip tracks by pressing the right-arrow (next) or left-arrow (back) keys. You can choose from other visualizers by selecting one in the View > Visualizer menu. The settings available for each visualizer are different. For the iTunes Classic Visualizer, see this article. It’s a lot less interesting than the newer iTunes visualizer. 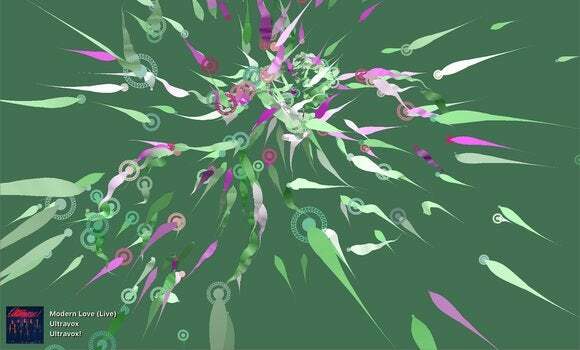 You can make lots of interesting desktop backgrounds using the visualizer. Just press Command-Shift-3 to take a picture of the screen at any time; it will be saved on the desktop. Open System Preferences, click Desktop & Screen Saver, then Desktop. Drag an image to the well near the top of the window to use it as your wallpaper.